Cradled amidst the hills of Aravallis, surrounded by dancing fields of maize and mustard, is the charming Lemon Tree Hotel. With picturesque greens and serene water bodies, this visually stunning and breathtaking resort at Tarudhan Valley in Manesar, just outside Delhi, exudes an old world charm, welcoming you and your pet dogs. Yes, this Lemon Tree Hotel is pet friendly. Spread across 72 acres, Lemon Tree Hotel in Tarudhan Valley envelopes a standard 9 hole golf course designed by Graham Cooke, one of the most respected golf course architects in North America and Canada’s top legendary amateur player. This makes the hotel a perfect haven for golf enthusiasts from the world over. You can wake up to the sweet smells of Frangipani or Plumeria flowers, in 70 contemporary well-appointed rooms, including 18 studio apartments with kitchenettes that offer an awe-inspiring view of the golf course. Designed to suit all experiences, it is also a bird watcher’s paradise with numerous migratory birds making this their second home. For the soul searchers, it’s a maze of cobbled walls, paved niches, alcoves and stone fountains that make it a perfect dream escape for a tranquil holiday away from home. Apart from the lovely amenities, this resort is pet friendly, as it invites your furry friends in with open arms, making sure your vacation is even more special. The hotel has a pet-friendly block of rooms that are located next to the pet play area, which are allocated for all bookings with pets. They organise a dog bed/mattress, along with a food bowl, poop scoop and a chew toy/bone per dog for every room that is booked with a pet(s). They also provide spare leashes, available on request. When it comes to outdoor play area for pets, there is a designated area right in front of the pet friendly rooms, which can be accessed from any of the rooms. In addition to this, there is also a designated area at the restaurant, at the al fresco area, where pets can sit with their family. There is a good mix of pre-packaged and freshly prepared pet food available at the hotel within a 24 hour notice period. The pet food menu is available in the pet friendly rooms. Aside from this, the hotel will always try to cater for any special requirements, particularly those shared with them well in advance, and arrange different types of cooked and packaged meals to suit every dog. Lemon Tree Hotel in Tarudhan Valley has extremely pet friendly staff. Not just at this hotel, but at each of its branch across India they adopt a stray dog. They name the dog, inoculate him and feed him well. Based on the personality of the dog, he is assigned a ‘fun’ role in the hotel and this brings joy to employees and guests alike. Therefore, a majority of employees at the hotels spend time around dogs, and are very dog friendly. The dog at Lemon Tree Hotel, Tarudhan Valley, is named Brandy. Currently, only Lemon Tree Hotel at Tarudhan Valley is pet friendly. But they are working to identify if other hotels in the chain can be converted into pet friendly hotels. Ritu Arora and Divya Dugal are among the travellers who recently checked in to Lemon Tree Hotel at Tarudhan Valley with their dogs. “My dog Snuffles loves to be with us on holiday trips, not happy to be left at home. Fulfilling her desire, thank god there is a place at last, Lemon Tree Hotel at Tarudhan Valley, where we and our loved pet can holiday together,” says Ritu. “It was fabulous. Snuffles played around in the designated play area in the hotel, which I must say is quite huge! It was lovely to sit in the pet lawn and see her running and frolicking around us. It was a joy to see other pets as well. Snuffles would roam around the pet friendly block, resort rooms, pooping area and the designated pet friendly area in the restaurant. The hotel staff are really pet friendly. They seem to be well trained to handle pets and almost foresaw all our needs,” comments Ritu. She says she would repeat the experience again and motivate every pet parent to travel with their pets. Divya frequently travels with her two furry travellers—Marco Polo and Tigress. “Over the last two years we have been travelling to many places. My doggies always enjoy and love travelling with me. Even we once went on a train trip of the Indian Railways. After all, Lemon Tree Hotel at Tarudhan Valley is unique among other pet friendly resorts. The hotel is well-equipped to host furry guests. Everyone among the hotel staff is pet-friendly,” she remarks. “The designated play area for the pets set in front of the hotel rooms is a great idea. Pets get full liberty to play, rest, and roam around this area,” say Divya, adding that the hotel manages well to provide quality food and treats for the four-legged guests. She says Lemon Tree Hotel at Tarudhan Valley is the right place to check in with your pet dogs and her message to pet parents is that every pet dog deserves to enjoy holiday, travel with them. 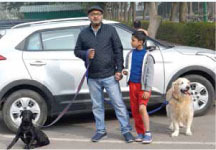 Yet another pet parent who checked in to the hotel with his furry travellers (Joey & Bambi), Gaurav says he enjoyed holidaying in the resort and the pets loved to be there.